Memorials/notes etc. 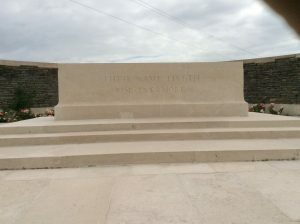 Oakley War Memorial. Waddesdon Deanery Magazine. Oct 1915 – C Co 6th Oxfordshire and Buckinghamshire Light Infantry, kia. Estaires was a centre for medical units from early in the war. In April 1918 it fell into German hands and it was recaptured later. 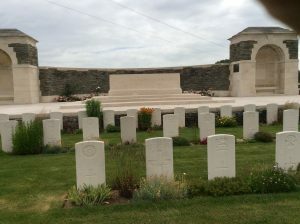 The Communal Cemetery was used for burials until June 1917 and the Extension thereafter. 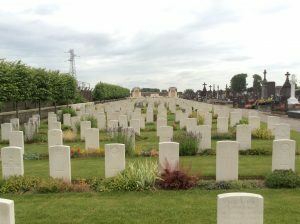 Altogether they contain the graves of 661 British, 6 Canadian, 139 Australian, 56 New Zealand, 9 Indian, 2 French and 6 German soldiers. 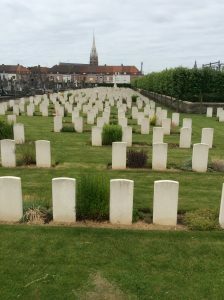 There are also the graves of 9 British servicemen of the Second World War. The 6th (Service) Battalion (6th OBLI) was formed at Oxford in September 1914. 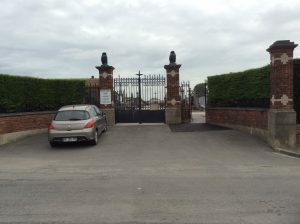 It became part of the Kitchener’s Second New Army (K2) and placed in 60th Brigade, together with 6th Battalion, King’s Shropshire Light Infantry (6th KSLI); 12th Battalion, King’s Royal Rifle Corps (12th KRRC) and 12th Battalion, Rifle Brigade (12th RB), in the 20th (Light) Division). The men were sent to the trenches for instruction in trench warfare . 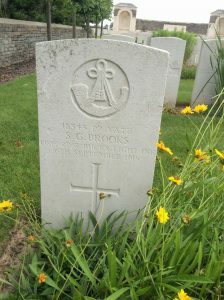 The men were paired with soldiers of the 2nd Devonshire’s while they learnt to work as platoons in the trench lines. The 6th Ox & Bucks went into the trenches for the first time on 10 August 1915. 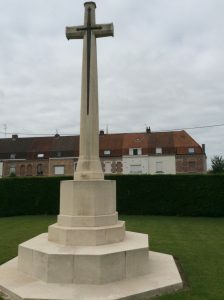 For the next twelve months, the Battalion carried out heavy and often dangerous duties in holding various parts of the front line, at Estaires, Fleurbaix and Poperinghe, without the satisfaction of having taken part in any major action. Parties of men, 3 or 4 platoons at the time employed both by day and night on fatigue work in the trenches or at the Brigade (?) Store. On 5th 29th Reinforcement of 850R arrived. In the afternoon relieved the 1/Queens in the same section at GIVENCHY, now re-numbered B3. A little bombing, but on whole quiet night.